The Cornell University Library and the Cornell Daily Sun are collaborating on an ambitious new digitization project to provide online access to the Sun's historical files. All of the original newspapers will be scanned and made available on a web site maintained by the Cornell University Library. For more than 120 years, the Sun has provided news, information, and entertainment to the entire Cornell community. Accounts of campus events and activities, sports reporting, and editorial commentary all contribute to make the Sun one of the most important sources of information on the history of the university. Written and produced entirely by Cornell undergraduates, the Sun is also a rich resource for social and cultural historians - illuminating the perceptions and documenting the concerns of collegiate men and women from the late 19th-century and through the entire 20th century. The contents of each issue also will be indexed and a database created so that alumni and other users will be able to search the entire Sun archive for articles by subject, writer, or date. 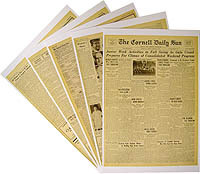 For example, a former Sun reporter could find all the articles she wrote; a football player could find all stories that mentioned his name; and researchers, from historians to novelists, will be able to find documentation of campus, local and worldwide events and the opinions they generated among Cornellians of the period. The new web site will allow access to this vital resource, at any time and from anywhere an Internet connection is available.